1970 – Salvador Allende became President of Chile, the first Marxist to become president of a Latin American country through open elections. 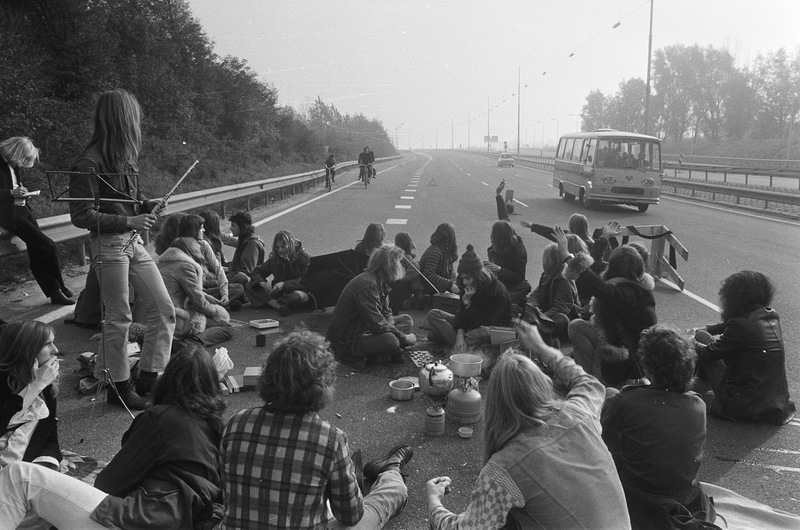 1973 – The Netherlands had the first Car-Free Sunday caused by the 1973 oil crisis. Highways were used only by cyclists, horses and roller skaters. 1979 – Iran hostage crisis: A group of Iranian college students overran the U.S. embassy in Tehran and took 90 hostages. 1980 – Ronald Reagan was elected the 40th President of The United States, defeating incumbent Jimmy Carter. 1993 – China Airlines Flight 605, a brand-new 747-400, overran the runway at Kai Tak Airport. There were 23 minor injuries, fortunately no-one was killed. 1995 – Israeli prime minister Yitzhak Rabin was assassinated by an extremist Israeli. Hili has to endure a true deprivation this morning. 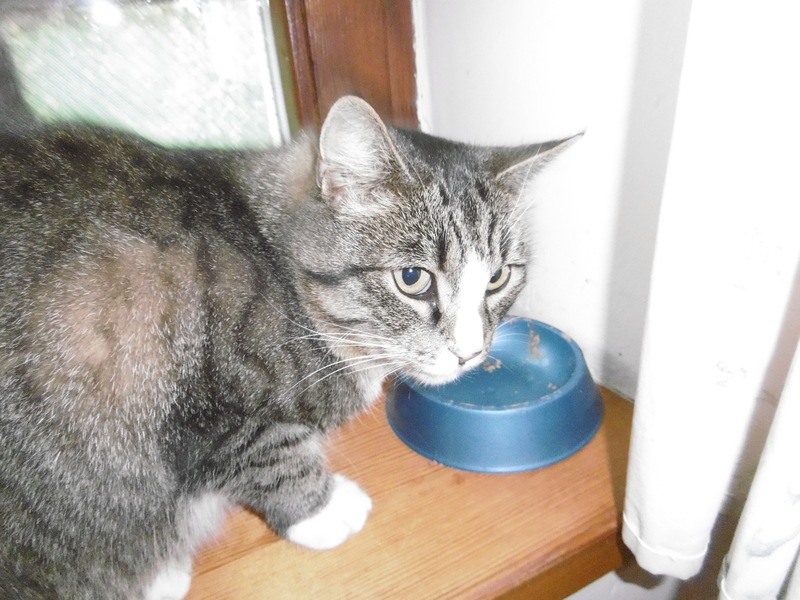 Hili: May I have some more, please? A: I don’t have any more bacon. Ja: Nie mam więcej boczku. And this one, come to think of it. The whole thread on this one is worth reading. The girl he references is the one in this true story. Road signs in Bhutan. I wonder if they work. Here are some whales breaching. In spite of the caption, these whales are not William Wallace. According to Whale Watch New Zealand there are several theories. Likely theories for breaching include competitive displays between males (we only have the male sperm whales off the Kaikoura Coastline), it could be a warning of danger coming such as predators in the area. Another theory is that it could be some form of communication – sound travels faster in water than air and it could be a quick way to transmit information to other whales in the area. It has also been suggested that it might be a technique to stun or scare their prey which in turn helps them feed as well as shed loose skin which may be irritating them. My little experiment growing strangler figs on lava rock (instead of soil) seems to have worked! The goal is to mimic the famous figs growing on the ruined temple walls of Angkor Wat. And finally, when Twitter is genuinely useful, the author was able to get it identified and translated (It’s German in Sütterlin script that makes it hard to read) in the thread that followed. This entry was written by whyevolutionistrue and posted on November 4, 2018 at 5:41 am and filed under Hili Dialogue. Bookmark the permalink. Follow any comments here with the RSS feed for this post. Both comments and trackbacks are currently closed. It is nearly always Humpbacks (Megaptera) breaching, I haven’t seen another species doing that, but then I’m not a 24/7 whalewatcher. Not mentioned: maybe they are just playful, having fun? That cat was considered (in another thread) as being an indication that Medieval cats might indeed have had more human faces than most extant ones. Owls just don’t just have surprisingly long legs, but surprisingly huge mouths, their relatively small looking beaks are misleading. And their eyes are even bigger than they appear: they are tubular, because if they would be more or less spherical they would not fit in their heads (they compensate for their lack of eye mobility due to ‘tubularity’ by being able to turn their heads more than 180 degrees). The Bhutan roadsigns are great, but how many cars are there in Bhutan? All sorts of cetaceans breech, including Minke and Sperm whales, Orcas and many species of dolphin do it too too. Humpbacks do it a lot though, and they are the most watched. “There she blows! A hump like a snow-hill!” as the crew of the “Pequod” said of the breach by certain sperm whale. That yellow snake is truly amazing. I would not have thought it could get sufficiently tight curvature to grip the rope. One of the many crimes for which Henry Kissinger has yet to face justice. Re: Black Hole – 3.6 septillion yottawatts! It’d be nice to be able to tap into some of that and reduce oil and coal. Re/ the binary black hole system…as with all videos/photos of stuff like that I watched it over and over again trying to grasp what was happening on an instinctive level. I always fail – I know what’s happening, I know the processes taking place are astonishingly extreme, but I can’t grasp it in the same way I can grasp the size of a giant redwood, or the ferocity of the average dynamite explosion. Very quickly the human brain runs up against a wall of incomprehension. It’s like the Hubble ultra deep field photo: I can tell myself that each of the splodges is an entire galaxy, and that each galaxy contains something like a billion to ten billion stars, with their own solar systems(sometimes shared with other stars, but still), but it doesn’t hit me in the same way that a picture of, say, the grand canyon does. Part of me has always been frustrated that these kinds of phenomena don’t translate, that we have not evolved to be able to understand them in the same instinctive way we do with comprehensibly big or powerful things. I’ve always thought going into space would be a bummer as a result, because I suspect I wouldn’t feel it like you’re meant to. I’d just be up there staring at the view and saying how wonderful it is, like they all do when they’re up there, while my brain stubbornly refused to accept that it wasn’t some kind of very elaborate, sophisticated screen-saver. On the other hand, if our emotional reactions really did scale up proportionally, so that something a million times bigger than the grand canyon would be a million times more amazing, our brains would probably pop every time we looked up at the sky at night. And we’d just collapse in a puddle of indescribable agony every time we so much as thought about the holocaust. So it’s probably for the best. We could smoke a joint and get really deep into this stuff. Or, just admit we’ll never grok such bigley quantifies. Then again we may just need practice at thinking about bigger dimensions. We may need to bring these big numbers into our heads more often and build familiarity trees in memory so that we can relate big facts to smaller facts. The distance to the sun is 465 times farther than to the moon. One day perhaps, when space flight beyond orbit becomes routine, these measurements will become familiar to kids in the 2nd grade so as adults they’ll consider distances to planets and stars to be, well, kids stuff. Maybe. Maybe we can learn to appreciate it, train ourselves…but I think probably we just can’t, in the same way that we can’t imagine a fourth dimension. Still, emotionally speaking I get _something_ from looking at that Hubble deep field photo. It’s like feeling around the edges of a great shape in the dark, just occasionally getting the tiniest hint of what it would look like if the lights were on. And that’s pretty cool even if I can’t take it all in like I want to. I’ll decline the kind offer of weed though…that stuff does me no favours. Patience, young grasshopper. Use the force,/i> like it’s going out of style. Yes, I think getting “something” is a trait common to humanity. We sense the transcendent in the dimensions beyond comprehension. Perhaps a major source of religious sentiments(or Twilight Zone scripts). I don’t do weed either. It makes me wonder what’s in the basement and who’s on first. Missed an significant death: Wilfred Owen, one of the greatest poets of last century, who was killed in action 100 years ago today – just a week before the Armistice. But it is sweet and honorable to die for one’s country. https://www.afsc.noaa.gov/nmml/education/cetaceans/cetaceabeh.php – whales sticking their heads out of the water isisn’t breaching, it’s called “spy-hopping”. I learn that sharks and rays also breach. This is an amazing video of a bunch of devil rays breaching https://www.youtube.com/watch?v=EAhCKoVxDZs. They’ve got wings, why not fly? They’ll have to try a lot harder than that. TIL that in Bhutan, BRO means Border Roads Organization, and is not a term of address. Except Sweden is huge – it is 1,200 km between the lake of Vidöstern at Tånnö (the sword find) and Malå (the white caribou sighting). That is the distance between New York and Atlanta, say. Shh! Don’t ruin our dreams! What I got from this was: The Speckled Band is possible.